The hartebeest is a grassland antelope living in central and southeastern Africa. Characterized by their long legs, large chest and sharply sloping back, these antelopes have curving horns and coats that range from dull sandy brown to tawny red to almost black, depending on the subspecies. The common name "hartebeest" is derived from the Afrikaans hertebeest. The name was given by the Boers, who thought it resembled deer. In Dutch, the word hert means "deer", and beest means "beast". Our Gxx codes denote individual pieces. 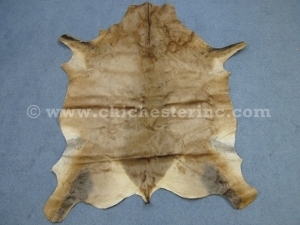 If you would like to order a specific hartebeest skin, please go to our Gallery to pick the exact one shown. Genus and species: Alcelaphus buselaphus. Hartebeest are not an endangered species and are not subject to CITES controls.